This browser does not support the Canvas element, required by our animation library. To view the animations, please upgrade to the latest version of Google Chrome, Firefox, or Internet Explorer. 246. 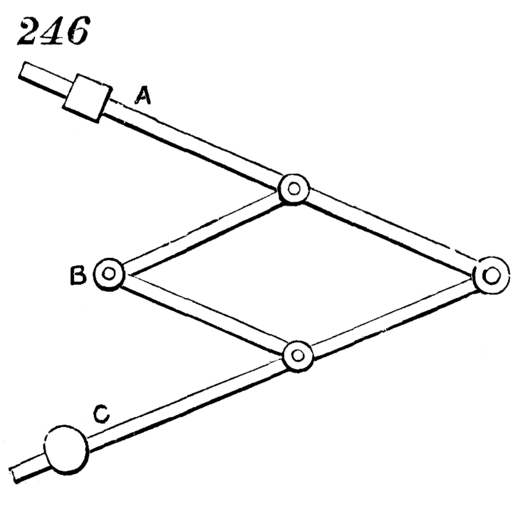 Represents a pantograph for copying, enlarging, and reducing plans, etc. One arm is attached to and turns on the fixed point, C. B is an ivory tracing-point, and A the pencil. Arranged as shown, if we trace the lines of a plan with the point, B, the pencil will reproduce it double the size. By shifting the slide attached to the fixed point, C, and the slide carrying the pencil along their respective arms, the proportion to which the plan is traced will be varied.